The Meister Cup ski race is a New England classic – open to 200 racers in teams of five, gathering locals in vintage ski attire, along with some very competitive North Conway racers and Veterans, all for fun and fundraising for the New England Ski Museum. Racing in full 10th Mountain Division ski gear is not for the timid, but what a photo opp. The first weekend in March at Cranmore Mountain is the annual Hannes Schneider Meister Cup (the 20th annual in 2016), a race that pays tribute to America’s mountain troops and the founding father of ski instruction, Austrian Hannes Schneider who served as a mountain soldier in World War I. The entire Meister Cup weekend is a celebration of skiing, starting with a Welcome Party (the who’s who of the ski industry) and Torchlight Parade at Cranmore, then the big quest for the Cup, a Dual GS, following an Opening Ceremony with full Color Guard of active duty 10th Mountain Division members. Après Ski festivities include a vintage skiwear show, a Silent Auction stocked with ski memorabilia and swag, and a Bavarian Band playing at Cranmore’s Zips Pub. Hannes Schneider’s son, Herbert Schneider was a member of the 10th Mountain Division in World War II and became owner of Cranmore. Hannes’ grandson Hannes now typically presents the trophy and awards for the day’s ski race – which includes the coveted Carroll Reed Cup for the fastest ski industry team. The Meister Cup race and celebration was founded by Cal Conniff and Herbert Schneider – whose father Hannes came to North Conway and Mt. Cranmore in 1939. Hannes Schneider was released from Nazi captivity, and brought alpine skiing technique to New Hampshire and the states, as the Eastern Slope Ski School. The 1943 founding of Camp Hale in Colorado was where the U.S. Army’s 10th Mountain Division trained. 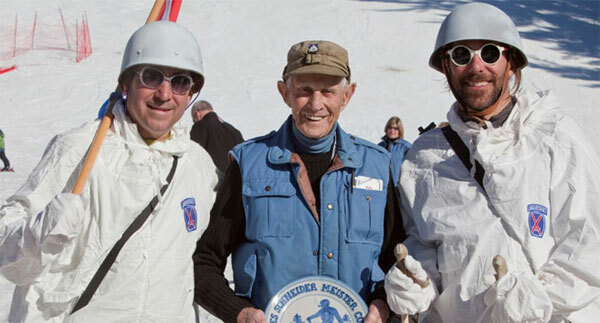 The Meister Cup remembers that legacy, and benefits the New England Ski Museum which was founded in 1977. The ski museum has been at the base of the Cannon Mountain Tram since 1982, offering free admission, and a great display of downhill skiing history, including archives and equipment from 10th Mountain Divisions skis and boots to Bode Miller’s medals.